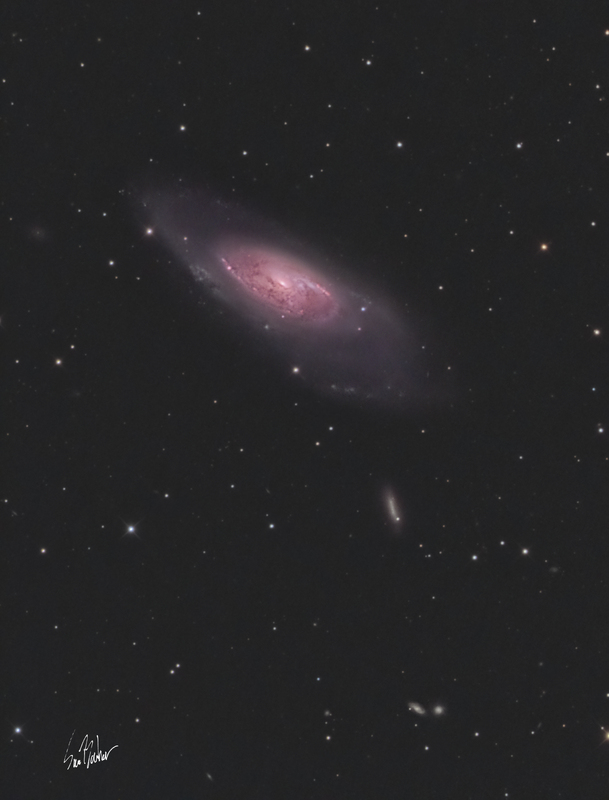 M 106 is a very interesting galaxy in a very interesting area of the sky. The core has a supermassive black hole (like most sizeable galaxies), and it has two elliptical disks, the inner undergoing intense star formation. There are also very beautiful arms of ionized hydrogen extending from the core that I could have captured with my Ha filter but did not because of time constraints at my “dark” site (a bortle 4.5). This data was taken during the new moon under good dark skies and therefore I was able to make a nice image out of less data than is usually required from my backyard (a bortle 9). Also, on a random side note, I think this is the first vertically oriented picture I have taken with this camera.